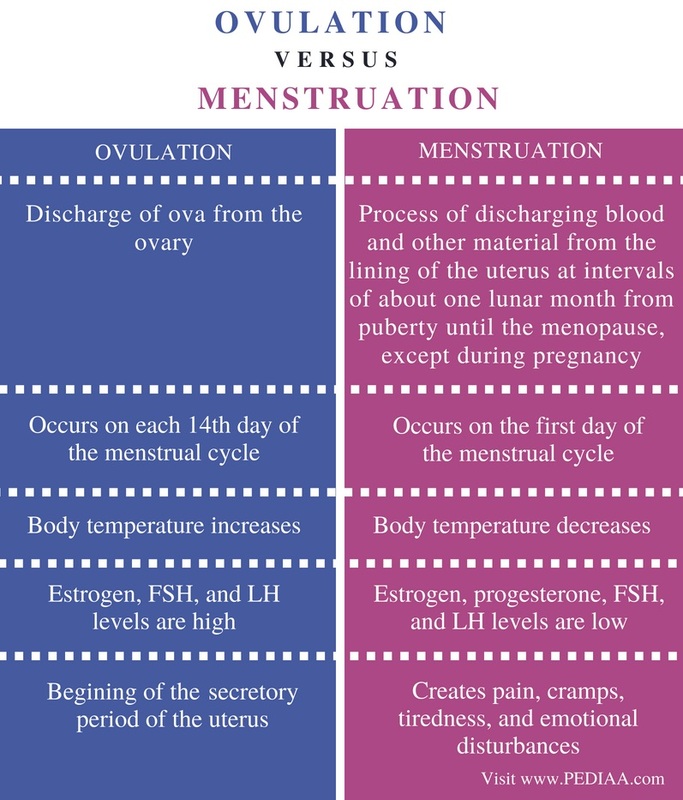 The main difference between ovulation and menstruation is that the ovulation is the release of eggs from the ovaries whereas the menstruation is the regular discharge of blood and mucosal tissue from the inner lining of the uterus. Furthermore, ovulation occurs in the middle of the menstrual cycle while menstruation is the initial event of the menstrual cycle, which marks the beginning of a new cycle. 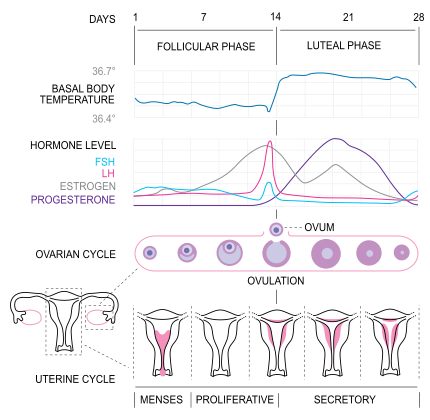 Ovulation and menstruation are two events of the menstrual cycle. Both events are regulated by the hormones estrogen, progesterone, FSH, and LH. Ovulation is the release of eggs in the middle of each menstrual cycle. It involves the release of a mature egg from the ovary and pushing it down through the Fallopian tubes in order to make the egg available for fertilization. In humans, a single ovary matures an egg per one time. The development of an egg inside the ovary is stimulated by FSH (follicle-stimulating hormone), a type of gonadotrophin produced by the anterior pituitary. FSH also stimulates the production of estrogen by the ovary. Estrogen is responsible for preparing the uterus for the fertilization event. The levels of estrogen are low at the beginning of the menstrual cycle, but they gradually rise with the development of the follicle. High levels of estrogen stimulate the production of fertile cervical mucus. The rapid elevation of the levels of LH (luteinizing hormone) stimulates the rupture of the developed follicle, releasing the egg. The released egg from the ovary can survive only for 24 hours inside the female reproductive system. Thereby, the day of ovulation is the most fertile day in the menstrual cycle. However, since sperms can survive 3-5 days inside the female reproductive system, the fertile period of the menstrual cycle is known as the fertile window. In addition, the ruptured follicle in the ovary starts to produce progesterone, which builds up the uterus wall. Menstruation is the periodical process of shedding the materials of the inner lining of the uterus. It occurs at the beginning of each menstrual cycle. If the egg has not fertilized, the levels of both estrogen and progesterone drop gradually. When the levels of these hormones are low, the inner lining of the uterus starts to break. This lining is shed along with the blood as menstrual flow. The first day of the menstrual cycle is considered as the first day of the next menstrual cycle. Menstruation starts 14 days after ovulation and the length of the menstrual cycle can be 21-42 days depending on the individual. The main role of menstruation is to prepare the uterus wall for the next menstrual cycle. Ovulation and menstruation are two events of the menstrual cycle. Both processes are repeated in intervals of 28 days. The occurrence of these two events is regulated by hormones. Ovulation refers to the discharge of ova from the ovary while menstruation refers to the process of discharging blood and other material from the lining of the uterus at intervals of about one lunar month from puberty until the menopause, except during pregnancy. This definition itself explains the important difference between ovulation and menstruation. Ovulation occurs on each 14th day of the menstrual cycle while menstruation occurs on the first day of the menstrual cycle. Body temperature increases with ovulation while body temperature decreases with menstruation. Estrogen, FSH, and LH levels are high during ovulation while the levels of estrogen, progesterone, FSH, and LH are low during menstruation. The secretory period of the uterus begins with the ovulation while menstruation creates pain, cramps, tiredness, and emotional disturbances. Ovulation is the process of releasing an egg from an ovary to the uterus. It occurs at each 14th day of the menstrual cycle. Menstruation is the shedding of the inner lining of the uterus along with blood when the released egg has not fertilized. It marks the beginning of the next menstrual cycle. The main difference between ovulation and menstruation is the type of process and their role in reproduction.